This band of heavy metal desk sculptures will rock your workday. 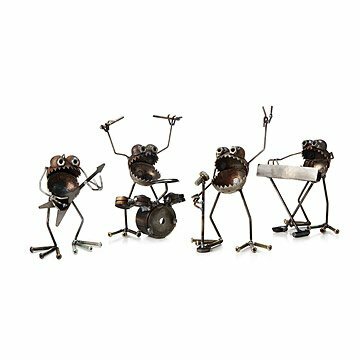 Rock the workday away with this heavy metal troupe of desk sculptures. Using found materials and a hint of humor, sculptor Fred Conlon welds, shapes, bends and gives new life and personality to objects whose usefulness has expired—a rusty screw morphs into a microphone and forgotten metal scraps become a musical focal point in your home. Handmade in Salt Lake City, UT. Each sold separately. Decided I'd get one of these for my brother, dad, and myself as kind of a token for our relationships among one another. Shopping for both my brother and dad is difficult as both prefer to shop for others rather than themselves, but this little surprise was worth every penny, and serves as a cute reminder. I purchased the "singer" for my husband as a desk ornament for his office. This little guy is so expressive and well-crafted. Love it. It was a perfect match for my brother whose occupation is in the tool and dye field. Product=GREAT! Our son lives o.o.town and is a drummer. The heavy metal rock band drummer for an early BDay present was more than FUN and joyful! When gift arrived we opened it together 'long-distance' while I sang :"HBDay to HIM" What a memorable evening...very touching,too! I got the whole band! My sister has the garden nome critters also. She loved the rock band too! !